I hate hard boiled eggs too. We dye eggs and toss them. But I'm excited- we're going to start composting soon! Thank you so much for the award, Amalia! I hope your wrist clears up soon. That can't be fun, your way of working pulled out from under you like that. Is writing longhand against the "rules"? 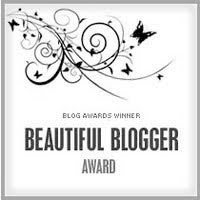 I will now attempt to put that beautiful award on my blog... wish me luck! Thank you so much for the award!!! I hope your wrist feels better soon. Hearing anybody's being forced off the computer gives me the beginnings of the DTs! I can't wait to pass on this award. Thanks again! Margo: You are so welcome! Writing long-hand is against the rules for now, but hopefully it will ease up soon! Thanks! Nicole: You're welcome! Thanks so much for the well wishes. It is definitely a trying time-- as proven by the fact that I am replying to your comment. Whoops! I am late to the thanking party it seems, but thanks! And if you ever need someone to eat those hard-boiled eggs for you, I am your girl. Ooh, bummer 'bout the wrist, good lady. Here's hoping for a rapid recovery. So sorry about your arm and wrist! Reduced computer?! Is there a harsher penalty? Well, I mean short of something that causes pain? Loved the reveals. I'm with you and Stephanie on the hard boiled eggs, though. Blowing eggs (weird thing to talk about) is a lot of work - do you use a pin or something bigger? Maybe I'm doing it wrong. Take care of that arm. We need you back in full form ASAP! Haha! I know how you feel about Thor. My antagonist was certainly not supposed to be my MC! Congrats on the award. It's always fun to get to know you better. I'm so sorry about your arm! Dang it! You'll be missed as you heal! Heal fast! Watch some movies and relax. I completely agree! I always feel like they are scared or cold. Hope your arm heals quickly!